UK Pub Stopovers - List YOUR business it's FREE! Attention Farm Shop/Vineyard/Brewery/Antique Centre/Craft Centre/Hotel/Other owners and of course Publicans! We are always looking for more motorhome friendly locations that are willing to allow the occasional motorhome to park overnight when they visit your premises. If your business relies on public then motorhome people are ideal visitors as their vehicles are self-sufficient and only require a parking space. The availability of a fresh water tap and/or somewhere to empty their loo is an advantage but definitely NOT essential. Many of our existing locations don't make a charge for the parking but naturally expect visitors to patronise their business in some way and this is the message that we give to our members. Your motorhome visitors also abide by our guidelines which explain this and that they need to make contact before arrival. We appreciate that there may be times when it is inconvenient for such visitors to take up space in your car park. It is also made clear that the facility is for overnight parking only, and NOT for setting up camp in any way. Our member guidelines are available >>here<<. This listing service is completely free of charge to participating businesses. Your business will appear in a county by county listing giving basic details and also your own individual webpage which includes more detail, contact and location information by way of GPS co-ordinates, a Google map and we are even enhancing the listings with photographs if available (these can be taken from your website with your permission if you have one). 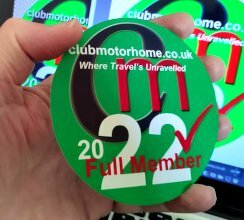 You are not required to sign up to, or join, any sort of 'scheme' as motorhomes only visit you by way of an informal agreement between yourselves and always by prior agreement.